The Tampa Bay Lightning NHL franchise recently honored Raymond Pawliclki, member of Vietnam Veterans of America (VVA) Chapter 195 in Dade County, Fla., as a Lightning Community Hero. 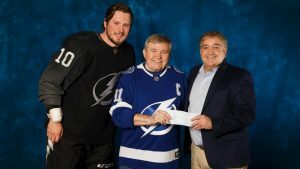 Pawliclki received a $50,000 donation from the Lightning Foundation and the Lightning Community Heroes program and will donate it to Hillsborough County Veterans Helping Veterans, The Society of St. Vincent de Paul (SVDP), St. Rita’s Conference and St. Vincent de Paul District Council of Pasco County. Pawliclki has assisted more than 100 veterans inside and outside the criminal justice system through Chapter 195. Pawliclki recently launched a re-entry program at Zephyrhills Correctional Institution (ZCI) to help veteran inmates better budget their time and money upon parole. Over the last three years, Pawliclki has been instrumental in providing re-entry assistance to 23 veterans, financial assistance to 37 veterans in need, and material assistance such as clothing, toiletries and/or shoes to 52 incarcerated veterans. Pawliclki is Tampa Bay’s 350th Lightning Community Hero. The Lightning Foundation has granted $17.6 million to more than 400 nonprofits in the Greater Tampa Bay area since the program launched in 2011–12.